Last week in Part 3 we looked at the unique front suspension system of Chalky, the new Human Powered Vehicle (HPV) I am designing and building. This week, I’ll cover the steering. For what initially appears to be a quite simple requirement (just turning the front wheels), it is amazing how quickly steering systems become complex. And of course, as with all HPV design – light weight. This means a minimal number of pivot points, both on the frame and in steering linkages. Therefore, in an article like this, it is very easy to disappear into complex discussions that don’t actually reflect how the steering system of Chalky was developed! In fact, I built and tested three completely different steering systems – but as only one was any good, let’s look at that design. With Chalky I therefore chose to use off-the-shelf Greenspeed kingpin assemblies that comprise the stub axle, kingpin shaft, brake mount and a steering lever, all integrated into one fabricated unit. I used Mark II GT3 designs – these suit the 16 inch wheels I am using, and provide negative scrub radius steering geometry. The steering of the GT3 recumbent trike is quite brilliant – and clearly better than I achieved with my previous Air 150 design. However, the GT3 (and for that matter, all the Greenspeed products) do not use long-travel suspension. To combine these kingpin assemblies with suspension therefore requires the use of a new steering system – otherwise bump steer will occur. At its simplest, to avoid bump steer, the steering arms should be the same length (pivot to pivot) as the effective length of the suspension arms, and the steering and suspension arms should be parallel. But as you’ll see, in the real world things get a lot more complex than that. The system I chose to use is a variation of the Greenspeed system used in their (now defunct) GTC model. It’s called by the company their ‘non-crossover’ design. The system uses two steering tie-rods and one central linking member turning on an offset pivot. The effect of the offset pivot is to provide the majority of the Ackermann compensation; the system uses only four rod-ends, one frame pivot and the two kingpin pivots. In addition, the steering rods are quite short. The steering uses handlebars that protrude vertically either side of the seat (as shown by the circles), resulting in a handlebar motion that is slightly side-to-side as well as fore-aft. 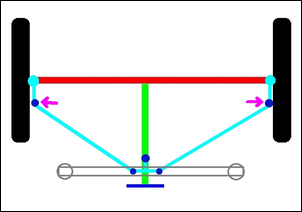 As can be seen in this diagram, the length of the steering rods is a little less than the effective length of the suspension arms. (See Part 3 in this series for more on the front suspension design.) So why doesn’t bump steer occur? It doesn’t for two reasons. Firstly, the drawing isn’t accurate – the tie-rod ends at the handlebars are actually positioned slightly rearwards of the handlebars, and secondly, the steering rods are not parallel with the suspension arm plane, so altering the geometry a bit. I found that by far the easiest way of dialling-out bump steer was to simply experiment with different steering layouts, temporarily brazing them into place (or even initially using electrical tape to hold parts in position) and then moving the suspension manually through its full travel, looking by eye at the bump steer changes that resulted. If you are watching a front wheel as the suspension is being moved, you can easily see toe changes of only a few millimetres. Another simple approach is to use a piece of string to connect the steering arm at the wheel with the potential position of the steering handlebars – moving the suspension up and down shouldn’t alter string tension. If it does, you’ll have bump steer. I want to heavily stress that doing these simple experiments is a lot quicker and easier than any other approach you can take – unless the steering system looks like one straight out of a textbook, the textbook solutions do not easily apply! When you are looking at Ackermann, also ensure (by eye or protractor measurement) that there is enough steering lock actually occurring – always watch only the inside wheel, the one that has to turn the greatest amount. Again that sounds mega complex, but here are some simple tricks. By far the best way of optimising Ackermann steering compensation is to have the trike mobile. It doesn’t need to carry weight but it must have three wheels fitted and be able to be moved and steered. I discovered the following technique by accident, but it works very well. Organise the steering so that the Ackermann compensation can be easily altered. In my case, I had cut off much of the original Greenspeed steering arms from the kingpin assemblies and had slipped some bent tube into the cut-off stubs. 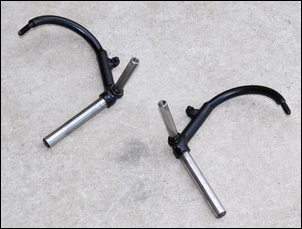 The outer tie-rod ends were mounted on the ends of these bent tubes. By rotating the bent tube within the original steering arm tube, I found that I could move the inner tie-rod ends (arrowed) inwards or outwards. This altered the Ackermann steering compensation. 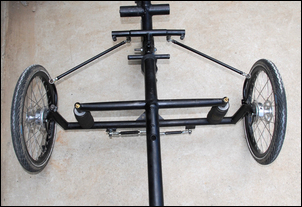 The next step was to select full steering lock and then simply push the semi-finished trike around on a large area of flat bitumen, whereupon the outer steering rod-ends located themselves to provide the correct Ackermann compensation! By altering the length of the steering arms and then experimenting on full lock, the best combination of turning circle and Ackermann compensation could be reached. At the same time, the steering ratio could be altered by moving the outer rod-ends closer to, or further away from, the kingpins (ie moving them longitudinally rather than laterally). Again, my ‘tube sliding inside the tube’ approach allowed me to do this easily. Making all these changes slightly (but only slightly) alters bump steer. When the Ackermann is right (and if it was right on full lock it proved to be fine on other steering locks) and the steering ratio correct, then the bump steer can be finally fixed – normally by altering the height of the inner or outer rod-end. In my case, I altered the height of the inner rod-ends, under the handlebars. Don’t underestimate the difficulty in optimising steering – it is truly fiendishly difficult... in fact, I’d suggest impossible to do without direct experimentation. People who have built only non-suspension trikes have it relatively easy! 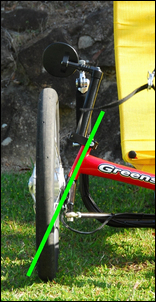 As indicated previously, the kingpin assemblies are modified Greenspeed GT3 units. These assemblies rotate in greased bronze bushes that are reamed to suit the kingpins and are mounted in Greenspeed-supplied frame tubes. The original steering arms were cut off just past the drum brake mounting point and 12.7 x 0.9mm chrome moly tube was bent (using a bench-mounted hand bender) to form a curved extension that projected rearwards and upwards. The kingpin assemblies are swapped left for right – that is, the steering arms project backwards and not forwards as they do when fitted to the Greenspeed GT3. I have found that a relatively cheap bench-mounted tube bender can very effectively bend chrome moly thin wall tube. One trick is to use a LOT of grease – on the tube and on the mandrel and former. Keep the bender moving constantly - that is, don’t start and stop the bend. By following these techniques you’ll find 12.7mm (half inch) x 0.9mm wall thickness chrome moly tube can be bent perfectly. Steering rods were made from 12.7 x 0.9mm chrome moly steel tube and used 8mm rod-ends. At the ‘wheel’ end, the rod-ends are positioned about 150mm rearwards of, and about 30mm above, the wheel centres. The curved steering handlebars are off-the-shelf Greenspeed GT3 units (they’re very light aluminium tubes) and the central part of the steering is chrome moly modified GT3. GT3 steering doesn’t usually use an offset pivot so the central part of the steering (containing the pivot) was cut out, the two remaining parts of the central steering assembly matched to a tube that spread them further apart, and the pivot brazed to an offset extension. The inner rod-ends of the steering handlebars are located on downwards-projecting extensions that are about 70mm long. The static castor is 12 degrees and the camber is just a little negative (about 1 degree). As with the front suspension, testing was carried out with the rest of the machine largely incomplete and without a working rear suspension. For safety reasons, this testing was carried out only at relatively slow speed - much of the steering was just tacked together. The steering will be left in this prototype stage until full testing can be carried out – how it copes with a heavy camping gear load, for example, can’t at this point be determined. I wish I could tell you that designing and setting-up steering is easy – but it simply isn’t. Or not for me, anyway. And the trouble is, I have come to believe that steering is the single most important driver control in any vehicle – be it HPV recumbent trike... or $300,000 Porsche twin turbo. I strongly suggest that rather than trying to invent your own steering system, you copy someone else’s that works well – and then just optimise it for your application. The fortuitous discovery that, in development, the steering can be set up to configure itself to provide the correct Ackermann compensation takes a lot of effort out of the process. Being able to on-the-fly adjust the steering ratio also makes things much easier to set up. At this stage, Chalky’s steering is looking good: if the only deficiency proves to be a large turning circle, it will stay as it currently is.